You now know how to configure a PWM, great ! Now let’s see how to use it. The first part of the code configures the pwm; as we have seen in the last tutorial. This line starts the PWM, it links the the PWMConfig to a PWMDriver. A PWMDriver is an Abstraction that allows you to control a PWM (actually it is rather complex and is out of the reach of this course for now). All you need to know is that there are PWMDrivers for timers 2 to 5, you can only use one PWMDriver by Timer (using 4 different frequencies on a single timer won’t work) and that in order to control the output of the timer i you have to link your PWMConfig to the pointer to PWMDi. The pwmStart function takes as parameters a pointer to a PWMDriver and a pointer to a PWMConfig (in order to know how to use the timer linked to the driver). That’s it, your PWM is ready to use ! Note that by default the signal is high half of the period. This tells the driver to set the output of the 1st channel of the 3rd Timer to HIGH for i ticks (at the period defined in the PWMConfig). 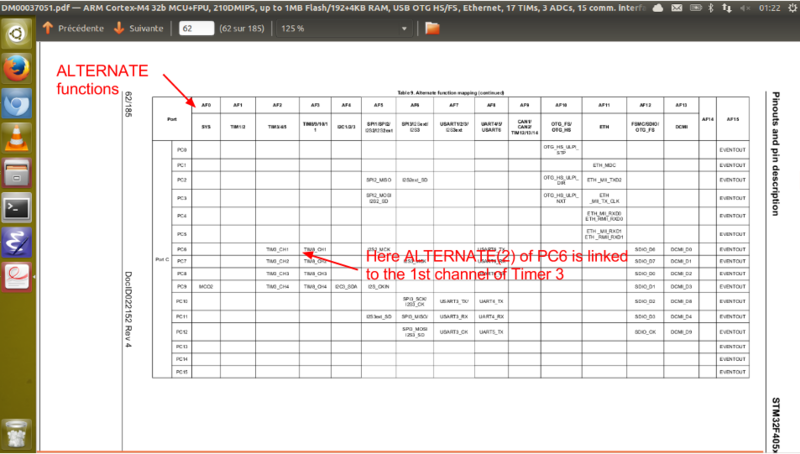 pwmEnableChannel takes three inputs: a pointer to the PWMDriver, the channel of the Timer (indexes start at 0, so 2 corresponds to the 3rd channel etc…) and the number of ticks to set the output HIGH. 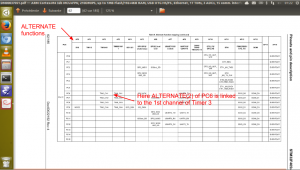 Note that each channel can have a different width (but they must have the same period and timer frequency). In this example you managed to control the brightness of the LED (if you plugged a LED on PC6 as in the Robotics 101 : Basic GPIOs course, as i mentioned in the first part of the PWM tutorial. And you’re done, it’s that simple : you now know how to use a PWM with chibiOS. In a next course we will see how to use it to drive a motor (as soon as i receive my H-Bridge order).